STERI TECHNO FAB is aesthetically designed hot air oven to meet requirements of various field of medical, agriculture, industries, laboratories and health care institutes. * Inner chamber polished Stainless steel & double walled. * Air ventilators are provided near top of the sides for removing hot gases and fumes. * PID Controller –Timer based operations. * Temperature range of 50° C to 250° C.
* High grade nichrome heaters. * Air circulating fan better uniformity of heat. 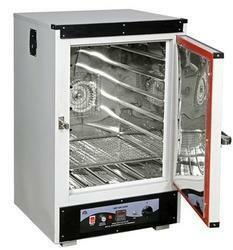 Looking for Laboratory, Hospitals & Industrial Hot Air Oven ?